With spring setting in most parts of India, it’s the perfect time for wildlife enthusiasts to pack their bags and throng the country in order to quench their thirst of spotting some of the rarest species that can still be found here. There are over 515 wildlife sanctuaries and 99 national parks spread across the length and breadth of the country. It also has the largest population of wild tigers across the world. From 1411 tigers in 2006, India managed to increase their population to 2226, which is indeed a quantum jump. 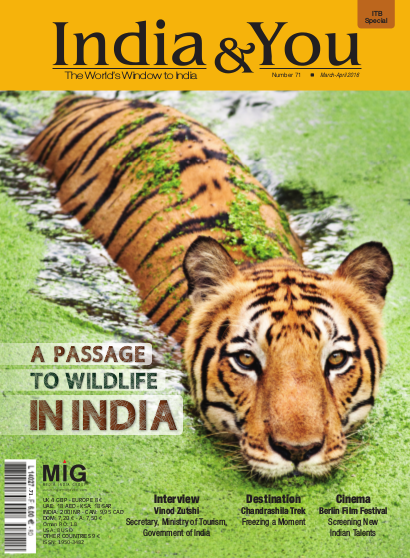 With this issue we take you through some of the mesmerizing wildlife safaris that will leave you asking for more. Not only will you dive into the wilderness but also experience the adventure of trekking to the Chandrashila Peak, Sufism of Dargah Ajmer Sharif and unique tribal culture of Nagaland amalgamated in the Hornbill Festival. We have tried to bring in a touch of modernity as well with famous Golf destinations, boutique hotels, emerging trend of chocolates in India and how eunuchs are struggling their way into the mainstream society. Knowing your love for Indian herbs, we have dug deep into the ancient times to bring the best of the home remedies. Finally with Indian cinema making its way to the Berlin Film Festival you will get a good insight of the new heights India is set to scale.